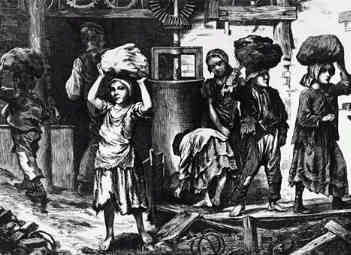 Though the Victorian era is regarded as the most dynamic era in which a number of reforms took place and mostly for the better like the Industrial Revolution etc yet it was the same period which also witnessed the deterioration in the working conditions of the people due to a variety of reasons. To start off, child labor was the most critical issue prevalent at this time. Children, as young as eleven years were made to work in dangerous mines and factories. They also worked as servants in other people’s houses. They worked for long hours to support their families and were extremely poorly paid. As consequence of the growing number of factories and mines which was a product of the Industrial Revolution, pollution increased. These factories, chimneys, and mines were operated by coal which when burnt released smoke causing pollution thereby affecting the health of the workers. The coal mines, especially, were extremely risky as well as dangerous places where roofs caved, explosions took place and where lots of injuries were suffered by the workers. To top this, the safety rules also were very few and not that effective. Young children were made to sit as trappers. They would sit in a hole hollowed out for them and held a string to fasten the door. As soon as they heard coal wagons coming in they had to open the door by pulling the string. Though this was an easy job, yet the place where they had to sit were clammy and not so hygienic. Older children, on the other hand, were made to work as coal bearers carrying loads of coal on their backs in huge baskets. 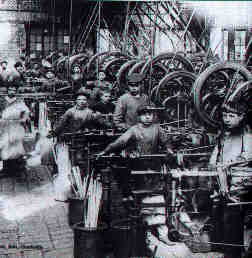 Mills, again, were places where thousands of children found employment. Usually, orphans were employed here who worked as well as stayed there. The treatment given to these children was quite crude. Most of their time was spent working in the mills which resulted in almost no time for them to get out and take some fresh air. Sundays were mostly spent in cleaning the machines thereby leaving no time for any recreation. In case if the children fell asleep during working, then they were also brutally killed. 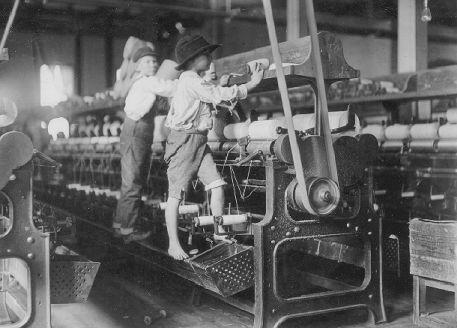 In factories and brick works, children were made to work long hours and do dangerous jobs. For instance, in match factories, children were made to dip matches in a chemical called Phosphorous. This phosphorous chemical caused the children’s teeth to rot and also resulted in the death of few of the children due to the continuous inhalation of the chemical. This situation was the same for the adult workers as well. Even they slogged for nine hours and were paid insufficiently. It took quite some time for the government to take some actions in order to stop this exploitation. With the passage of time, however, various enactments were passed like the Mines Act which prohibited the employment of women, girls as well as boys up to a particular age to work in mines. People like Sir Robert Peel and Lord Shaftesbury were some of the crusaders against child labor. Gradually, the workers also united to form trade unions and political organizations which protected their interests. All these factors contributed to a very great extent in improving the working conditions of the working class people.